Twinka is the only cat left that was born here. Her Grandmother was Siamese. 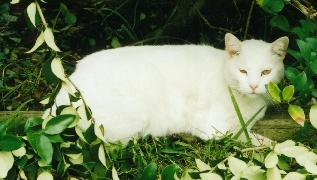 Twinka spent most of her early years huddled in the back yard. She was afraid of everything. Anytime I stopped in the yard, though, she would come try to climb into my lap. Now that the older cats are gone, Twinka gets to come inside nearly every day. Usually she runs as fast as she can to jump onto our bed. She thinks that if she pretends to be asleep we won't pick her up and take her out and she's right most of the time. 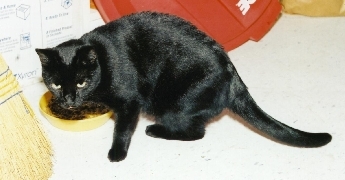 Storm is an abandoned cat that our son found in a box at the entrance to Kmart where he worked at the time. She and the two others with her didn't even have their eyes open. He fed them from doll baby bottles with our help. One was given to a lady with a nursing cat and we raised the other two, but one was run over.. Storm is a little bit eccentric, but we blame it on old age or the lack of a cat mother to train her. She was born a few years before "Desert Storm." Blue got his name from the 'Blue Team' at youth church camp. Another of our sons was the team leader. Some of the girls on the team found Blue in a parking lot under a car if I remember correctly and gave him to our son. Blue's fur is almost as fine as mink and his nose, footpads, and skin are very pink, but his eyes aren't blue. The camera caught him blinking one eye. 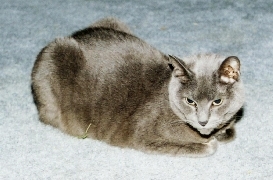 Blue died of natural causes this summer (2001) at the age of 10. Our oldest son didn't want cats in his apartment after living with cats all his life at our house. 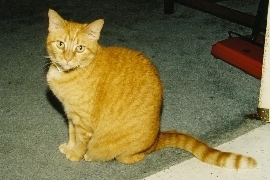 Ginger belonged to his fiancee, so Ginger came to us when they got married. Ginger basically took over our household. 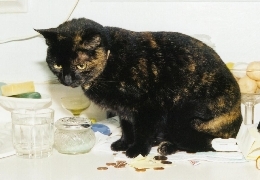 She is a very smart cat. Muffin has lived here for several years. When she was less than six months old, a little neighbor girl found her and brought her to us. She looks like Twinka. Winston is actually a girl, but the girl who named her didn't know that until later. The same son who found Storm knew Winston's owner, who was having to move and couldn't keep her. We told him not to bring us another cat, but he slipped her in and turned her loose on us and we couldn't resist. Winston loves to wrestle with Blue and Ginger and they enjoy playing with her. However, they won't have anything to do with each other. Rufus wasn't available for photos. A neighbor boy found Rufus, who is as black as Winston. He stays in the back yard most of the time. There are lots of shrubs and trees and an old storage building there for him to enjoy. This is not a current cat. 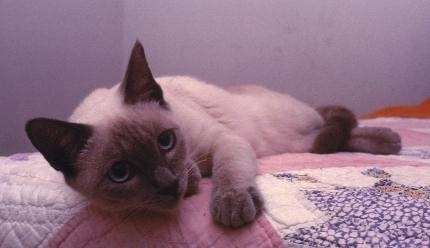 This is Windy in 1966, one of our original blue point Siamese. She was probably an ancestor of Twinka. Our son John took this 'blue ribbon'-winning photo of Christine. She was the mother of Twinka and perhaps a descendent of Windy. 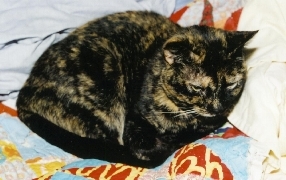 She lived for many years after this photo was made, but she was in very poor health during her final year. 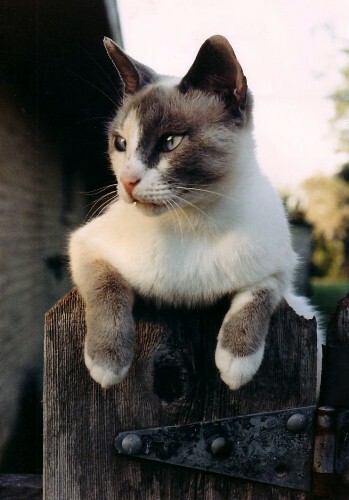 Christine was often waiting here on the fence when I got home from work.